This PDQ cancer information summary for health professionals provides comprehensive, peer-reviewed, evidence-based information about the treatment of childhood central nervous system germ cell tumors. It is intended as a resource to inform and assist clinicians who care for cancer patients. It does not provide formal guidelines or recommendations for making health care decisions. Primary brain tumors, including germ cell tumors (GCTs), are a diverse group of diseases that together constitute the most common solid tumor of childhood. The most recent classification of CNS tumors implements molecular parameters for the first time, in addition to histology, to define brain tumor entities. This led to restructuring some CNS tumor types, such as embryonal tumors and gliomas; however, per this updated classification schema, no molecular parameters are used to classify intracranial GCTs. Tumor location and extent of disease (brain invasion and tumor spread) remain important factors that affect treatment and prognosis. CNS GCTs are broadly classified as germinomatous and nongerminomatous germ cell tumors (NGGCTs) on the basis of clinicopathological and laboratory features, including tumor markers. [4,5] An alternative therapeutic classification in Japan distinguishes three groups on the basis of their prognostication: good prognosis (e.g., germinoma), intermediate prognosis (e.g., teratoma with malignant transformation), and poor prognosis (e.g., yolk sac tumor, choriocarcinoma, embryonal carcinoma, and mixed tumors of those entities). The PDQ childhood brain tumor treatment summaries are organized primarily according to the World Health Organization Classification of Tumors of the Central Nervous System. [4,5] For a full description of the classification of CNS tumors and a link to the corresponding treatment summary for each type of brain tumor, refer to the PDQ summary on Childhood Brain and Spinal Cord Tumors Treatment Overview. In Western countries, GCTs represent 3% to 4% of primary brain tumors in children; however, series from Japan and Asia report the incidence of CNS GCTs as approximately 15% of pediatric CNS tumors. [3,6-8] The genetic or environmental reasons for these differences remain unknown. Figure 1. Anatomy of the inside of the brain. 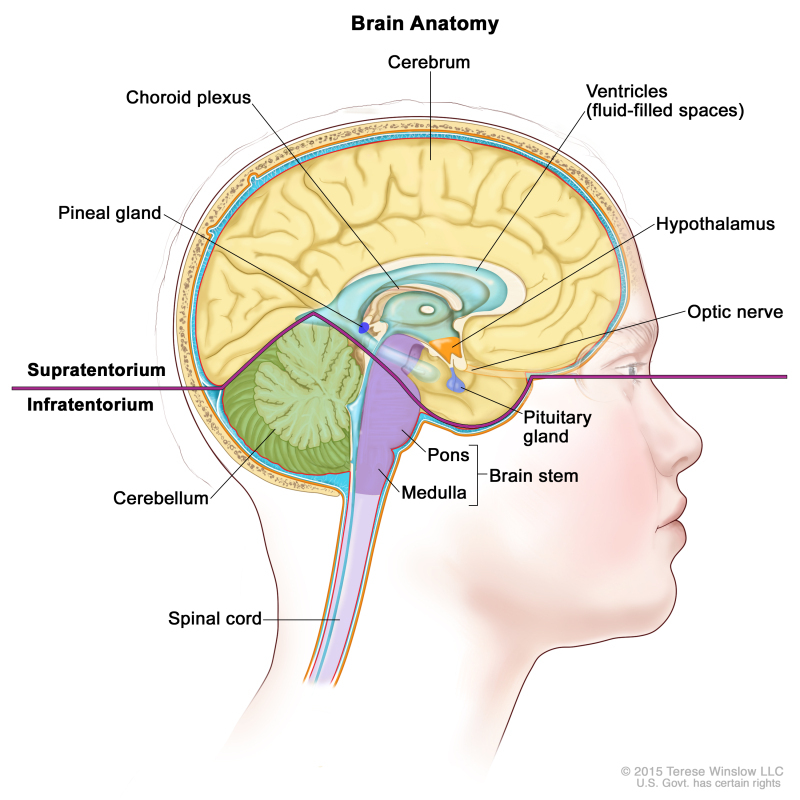 The supratentorium contains the cerebrum, ventricles (with cerebrospinal fluid shown in blue), choroid plexus, hypothalamus, pineal gland, pituitary gland, and optic nerve. The infratentorium contains the cerebellum and brain stem. In a study of 62 cases of intracranial GCTs, next-generation sequencing, single-nucleotide polymorphism array, and expression array showed frequent mutations in the KIT/RAS signaling pathway (50% of cases) and the AKT/mTOR pathway (19% of cases). To identify genes and specific pathways that may be involved in CNS tumorigenesis, tumors were profiled for DNA copy-number alterations and loss of heterozygosity using single-nucleotide polymorphism array and quantitative real-time polymerase chain reaction. These investigators found alterations of CCND2 (12p13) and RB1 (13q14), suggesting that this may implicate the cyclin/CDK-RB-E2F pathway in tumor formation. Gains in PRDM14 (8q13) were also noted. A separate study of 49 cases of intracranial GCTs confirmed high rates of KIT and RAS mutational activation (56%), global hypomethylation, and chromosomal instability (12p gains in 82% of cases and 13q losses in 45% of cases). Global hypomethylation mirrored primordial germ cells in early development. Pineal region. Patients with tumors in the pineal region usually have a shorter history of symptoms than do patients with tumors of the suprasellar or basal ganglionic region, with weeks to months of symptoms that include raised intracranial pressure and diplopia related to tectal and aqueductal compression. Symptoms and signs unique to masses in the pineal and posterior third ventricular region include Parinaud syndrome (vertical gaze impairment, convergence nystagmus, and light-near pupillary response dissociation), headache, and nausea and vomiting. Multifocal or bifocal tumors. Patients with multifocal or bifocal primary tumors may present with both suprasellar-region and pineal-region syndromes. Nonspecific symptoms such as enuresis, anorexia, and psychiatric complaints  can lead to delays in a diagnosis, whereas signs of increased intracranial pressure or visual changes tend to result in an earlier diagnosis. Characteristic clinical signs and symptoms supported by neuroimaging. GCT marker analysis in the serum and lumbar cerebrospinal fluid (CSF). Magnetic resonance imaging (MRI) of brain and spine with gadolinium. Visual-field and acuity examinations for suprasellar or hypothalamic tumors. If possible, a baseline neuropsychologic examination should be performed after symptoms of endocrine deficiency and raised intracranial pressure are resolved. A diagnosis of GCTs often requires a tumor biopsy, except when characteristic increased tumor markers are found in the serum and/or CSF. When the tumor markers are negative or mildly elevated but below diagnostic criteria, or if there is any noncharacteristic finding, a tumor biopsy is performed. It is crucial that appropriate staging is determined and that pure germinomas are distinguished from NGGCTs. Chemotherapy and radiation treatment plans differ significantly depending on GCT category and extent of disease. The Committee of Brain Tumor Registry of Japan: Brain Tumor Registry of Japan (2001–2004). Neurol Med Chir (Tokyo) 54 (Suppl): 1-102, 2014. Also available online. Last accessed January 25, 2019. Previous molecular studies comparing the genomic alterations in GCTs showed similar copy-number alterations whether the GCT was systemic or CNS based. In addition to the microscopic appearance of the various CNS GCTs, tumor markers (proteins, such as alpha-fetoprotein [AFP] and beta subunit human chorionic gonadotropin [beta-HCG], secreted by the tumor cells) found in the serum and cerebrospinal fluid (CSF) aid in diagnosis (refer to Tables 1 and 2). The diagnosis and classification of CNS GCTs can be made on the basis of histology alone, tumor markers alone, or a combination of both. [5-7] There is an effort to use tumor markers for prognostication on the basis of the presence and degree of elevation of AFP and beta-HCG. This is an evolving process, and cooperative groups in North America, Europe, and Japan have adopted slightly different criteria. For example, groups in the United States and Europe consider tumors to be secreting or mixed GCTs if serum and/or CSF AFP levels are 10 ng/mL or higher and/or serum and/or CSF beta-HCG levels are 50 IU/L or higher; however, several European and Asian groups designate tumors with serum and/or CSF AFP levels of 50 ng/mL or higher and/or beta-HCG levels of 100 IU/L or higher as secreting GCTs. Patients with pure germinomas and teratomas usually present with negative markers, but low levels of beta-HCG can be detected in patients with germinomas. Favorable-risk germinomas can secrete low levels of beta-HCG resulting from a syncytiotrophoblastic component. Nongerminomatous germ cell tumors (NGGCTs) can consist of one malignant NGGCT type (e.g., embryonal carcinoma, yolk sac tumor, endodermal sinus tumor, or choriocarcinoma) or contain multiple elements of GCT components, including teratomatous or germinomatous constituents. AFP = alpha-fetoprotein; HCG = human chorionic gonadotropin; PLAP = placental alkaline phosphatase; + = positive; - = negative; ± = equivocal. Elevations of tumor markers along with imaging findings are used as surrogate diagnostic markers for CNS GCT and may obviate the need for a histologic diagnosis. The tumor markers AFP and beta-HCG are the most useful, although other markers, such as placental alkaline phosphatase and c-kit, are being investigated. Distinguishing between different GCT types by CSF protein marker levels alone is somewhat arbitrary, and standards vary across continents. Patients with pure germinomas and teratomas usually present with negative markers, but very low levels of beta-HCG can be detected in patients with germinomas. Current efforts are directed at determining a marker threshold for beta-HCG–secreting germinomas, because data suggest that the beta-HCG levels of 50 mIU/mL in Europe and 100 mIU/mL in North America that are used to distinguish germinomas from NGGCTs are questionable. Either pineal region tumors or suprasellar primary tumors, normal AFP levels, and beta-HCG levels between 5 and 50 mIU/mL in serum and/or CSF. Bifocal presentation (pineal and suprasellar), suprasellar location, diabetes insipidus, normal AFP levels, and beta-HCG levels lower than 100 mIU/mL in serum and/or CSF. Alternative classification schemes for CNS GCTs have been proposed by groups such as the Japanese Pediatric Brain Tumor Study Group for CNS GCTs, who based their stratification on the prognostic grouping of the differing histologic variants, as shown in Table 3. Pure germinomas and mature teratomas fall into the good prognostic group; choriocarcinomas, yolk sac tumors, embryonal carcinomas, or mixtures of these three histologic subtypes fall into the poor prognostic group. Teilum G: Embryology of ovary, testis, and genital ducts. In: Teilum G: Special Tumors of Ovary and Testis and Related Extragonadal Lesions: Comparative Pathology and Histological Identification. Philadelphia, Pa: J. B. Lippincott, 1976, pp 15-30. Rosenblum MK, Nakazato Y, Matsutani M: Germ cell tumours. In: Louis DN, Ohgaki H, Wiestler OD: WHO Classification of Tumours of the Central Nervous System. 4th rev.ed. Lyon, France: IARC Press, 2016, pp 286-91. Frazier AL, Olson TA, Schneider DT, et al. : Germ cell tumors. In: Pizzo PA, Poplack DG, eds. : Principles and Practice of Pediatric Oncology. 7th ed. Philadelphia, Pa: Lippincott Williams and Wilkins, 2015, pp 899-918. Magnetic resonance imaging (MRI). In addition to whole-brain MRI, MRI of the spine is required. Lumbar cerebrospinal fluid (CSF). When medically permissible, lumbar CSF should be obtained for the measurement of tumor markers (alpha-fetoprotein [AFP] and beta subunit human chorionic gonadotropin [beta-HCG]) and for cytopathologic review. Serum tumor markers are often obtained for AFP and beta-HCG; however, they do not serve as a substitute for CSF tumor markers, if lumbar CSF can be safely obtained. Patients with localized disease and negative CSF cytology are considered to be M0 (metastatic negative); patients with positive CSF cytology or patients with drop metastasis (spinal or cranial subarachnoid metastases that arise from intracranial lesions) are considered to be M+ (metastatic positive). Appropriate staging is crucial because patients with metastatic disease may receive higher total doses of radiation and more extended radiation fields. Patients with bifocal intracranial germinomas limited to the suprasellar and pineal region are being treated in the same manner as are patients with synchronous, localized, nonmetastatic tumors in ongoing studies in North America (COG ACNS1123 [NCT01602666]) and Europe (SIOP CNS GCT II [NCT01424839]). For children older than 3 years and adults, radiation therapy has been an important component of therapy for germinomas and NGGCTs, although the optimal total dose and field size are debated. Germ cell tumors (GCTs) arising in the central nervous system, similar to gonadal and extragonadal GCTs, have demonstrated sensitivity to chemotherapy. Germinomas are highly chemosensitive and radiosensitive tumors. They are curable with craniospinal irradiation and local site–boost radiation therapy alone. However, the use of neoadjuvant or preirradiation chemotherapy allows reduced radiation therapy doses and volumes and, subsequently, reduced long-term radiation therapy–related effects. In North America, patients with localized germinomas are effectively treated with whole-ventricular irradiation supplemented with tumor site–boost radiation therapy. Focal irradiation to the tumor bed, regardless of response to chemotherapy, is considered inadequate treatment. Table 4 outlines the treatment options for newly diagnosed and recurrent childhood CNS GCTs. Neoadjuvant chemotherapy followed by response-based radiation therapy. Patterns of relapse after craniospinal irradiation versus reduced-volume radiation therapy (whole-brain or whole-ventricular radiation therapy) have supported the omission of craniospinal irradiation for localized germinomas. [8-10] On the basis of these results, the treatment for patients with localized germinomas has been modified to cover the whole ventricular system (24 Gy) followed by a boost to the primary site (40–45 Gy), rather than to deliver radiation therapy to the entire craniospinal axis or even to the whole brain. This change has not resulted in worse outcomes and is expected to minimize the acute and long-term toxicity of radiation therapy. Focal radiation therapy directed only to the tumor volume, even after neoadjuvant chemotherapy, results in inferior outcomes compared with whole-brain or whole-ventricle radiation therapy; therefore, focal radiation therapy is not recommended. Chemotherapy agents such as cyclophosphamide, ifosfamide, etoposide, cisplatin, and carboplatin are highly active in CNS germinomas. Patients receiving chemotherapy agents that require hyperhydration (e.g., cyclophosphamide, ifosfamide, and cisplatin) are often quite challenging to manage because of the possibility of diabetes insipidus in patients with primary tumors of the suprasellar region. COG-ACNS1123 (NCT01602666) (Chemotherapy Followed by Radiation Therapy in Treating Younger Patients With Newly Diagnosed Localized CNS Germ Cell Tumors [GCTs]): COG-ACNS1123 is a COG cooperative multi-institutional trial. This phase II trial of response-based radiation therapy for patients with localized germinoma (stratum 2) will compare the event-free survival and overall survival rates of a short course of chemotherapy followed by response-based, whole-ventricular radiation therapy, with a boost to the primary site. For patients who obtain a complete response after chemotherapy, the whole-ventricular radiation dose will be 25% lower than the standard whole-ventricular dose; for patients who have a less-than-complete response after chemotherapy, the standard whole-ventricular dose will be used, with or without second-look surgery. SIOP CNS GCT II (NCT01424839) (Prospective Trial for the Diagnosis and Treatment of Intracranial GCTs): This prospective, nonrandomized, multicenter study stratifies treatment according to risk groups. Teratomas are designated as mature or immature on the basis of the absence or presence of differentiated tissues. The Japanese Pediatric Brain Tumor Study Group stratifies teratomas for classification and intensity of treatment (chemotherapy and radiation) into the good-risk group (mature teratomas) and intermediate-risk group (immature teratomas) (refer to Table 3), while the Children’s Oncology Group includes immature teratomas with other nongerminomatous germ cell tumors. Adjuvant therapy, for patients who had a subtotal resection (controversial). The prognosis for children with central nervous system (CNS) nongerminomatous germ cell tumors (NGGCTs) remains inferior to that for children with germinomas, but the difference is diminishing with the addition of multimodality therapy. With the current treatment regimens, the 10-year overall survival (OS) for NGGCTs ranges between 70% and 80%. [1,2] NGGCTs are radiosensitive, but survival after standard craniospinal irradiation alone has been poor, ranging from 20% to 45% at 5 years. In patients with NGGCTs who suffer tumor relapse, most relapses occur within 18 months. Surgery, for tumors that partially respond to chemotherapy or for tumors that increase in size during or after therapy (possible growing teratoma syndrome). The optimal treatment regimen for CNS NGGCTs remains unclear. A Children's Oncology Group (COG) study (ACNS0122 [NCT00047320]) evaluated neoadjuvant chemotherapy followed by radiation therapy for children with localized NGGCTs. Neoadjuvant chemotherapy consisted of six courses with carboplatin/etoposide alternating with ifosfamide/etoposide. After chemotherapy was completed, responding patients received 36 Gy of craniospinal radiation therapy, with 54 Gy to the tumor bed. On the basis of a central review, 87% of patients showed either partial response (PR) or complete response (CR). For the 102 eligible patients in the study, 5-year event-free survival (EFS) was 84% ± 4%, and OS was 93% ± 3%. At 3 years, the EFS was 92% and the OS was 98% for all patients who achieved CR or PR either after induction chemotherapy or with the absence of malignant elements documented during second-look surgery. The European SIOP-CNS-GCT-96 (NCT00293358) trial evaluated neoadjuvant chemotherapy consisting of four courses with cisplatin/etoposide/ifosfamide followed by focal radiation therapy (54 Gy) for patients with nonmetastatic disease. Patients with localized tumors (n = 116) demonstrated 5-year progression-free survival rates of 72% ± 4% and OS rates of 82% ± 4%. A small percentage of patients treated with chemotherapy may have normalization of tumor markers with a less-than-complete radiographic response. Occasionally, a mass continues to expand in size even though tumor markers may have normalized. This condition is frequently designated as growing teratoma syndrome and may represent a lack of response by the more mature germ cell components (such as immature teratoma) to chemotherapy with or without radiation therapy. [7,9,10] In such circumstances, surgery is usually required for debulking, histologic confirmation, and exclusion of mixed germ cell tumor components. A second-look surgery can help determine whether the residual mass contains teratoma, fibrosis, or residual NGGCT. [2,11] If second-look surgery finds mature teratoma or fibrosis after chemotherapy, the general approach is to proceed with radiation therapy as if the patient had achieved a CR to chemotherapy. However, if an active tumor is observed, then alternative treatment approaches are generally considered. Baranzelli M, Patte C, Bouffet E, et al. : Carboplatin-based chemotherapy (CT) and focal irradiation (RT) in primary germ cell tumors (GCT): A French Society of Pediatric Oncology (SFOP) experience (meeting abstract). [Abstract] Proceedings of the American Society of Clinical Oncology 18: A-538, 140A, 1999. The most common type of relapse for childhood central nervous system (CNS) germ cell tumors (GCTs) is local recurrence at the primary tumor site; however, 30% of relapses are outside the primary site and/or combined with leptomeningeal spread. The outcome for patients with relapse, especially those with nongerminomatous germ cell tumors (NGGCTs), remains poor. Chemotherapy followed by additional radiation therapy. High-dose chemotherapy with stem cell rescue with or without additional radiation therapy. Enrollment on clinical trials should be considered for all patients with recurrent disease. Information about ongoing National Cancer Institute (NCI)–supported clinical trials is available from the NCI website. Early-phase therapeutic trials may be available for selected patients. These trials may be available via the Children’s Oncology Group (COG), the Pediatric Brain Tumor Consortium, or other entities. Information about NCI-supported clinical trials can be found on the NCI website. For information about clinical trials sponsored by other organizations, refer to the ClinicalTrials.gov website. Each chemotherapeutic agent has its own characteristic long-term side effects. Current clinical trials and therapeutic approaches are directed at minimizing the long-term sequelae that result from the treatment of CNS GCTs. Refer to the PDQ summary on Late Effects of Treatment for Childhood Cancer for specific information about the incidence, type, and monitoring of late effects in survivors of childhood and adolescent cancer. Rosenblum MK, Matsutani M, Van Meir EG: CNS germ cell tumours. In: Kleihues P, Cavenee WK, eds. : Pathology and Genetics of Tumours of the Nervous System. Lyon, France: International Agency for Research on Cancer, 2000, pp 208-14. Added Louis et al. as reference 4. Added text to state that a study of 49 cases of intracranial GCTs confirmed high rates of KIT and RAS mutational activation, global hypomethylation, and chromosomal instability. Global hypomethylation mirrored primordial germ cells in early development (cited Schulte et al. as reference 13). PDQ Pediatric Treatment Editorial Board. Childhood Central Nervous System Germ Cell Tumors Treatment (PDQ®): Health Professional Version. 2019 Jan 25. In: PDQ Cancer Information Summaries [Internet]. Bethesda (MD): National Cancer Institute (US); 2002-.